Mitsubishi Outlander Sport will get a new Limited Edition Trim level sits just above the base model ES.At the 2017 Chicago Auto Show it was showcased recently. The new Outlander edition of this crossover will cost you $21,995.The vehicle delivers fuel efficiency of 24 mpg in the city and 30 mpg on highways.The special edition of the car will be available in the showrooms at the end of this month. The exterior and interior has a black trim color theme.It has got 18-inch alloy wheels.The car gets an shiny silver alloy fuel door which contrasts the theme. 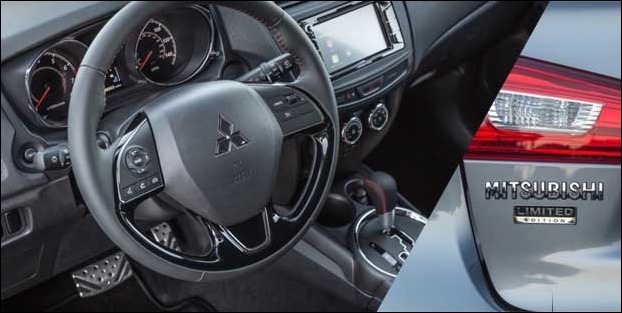 The interior of the crossover car has a rearview camera , a Limited Edition badge , red stitching on steering wheel , shift knob , aluminium pedals , Apple CarPlay and Android Auto in infotainment system.